With the Atnako be hide us, we headed North via Prince George, and then West to Terrace, so some early Autumn rain fed rivers in an area that has been getting some attention as the next big location town for outdoor people. 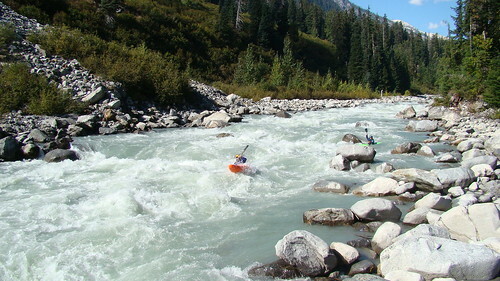 From the BC Interior, the road breaks through the Coast Mountains from Smithers to Terrace, there are several known runs, one of which the Babine is a classic 5 day raft support paddling trip. In Terrace we met up with old friends from Summer’s in Norway who have re-located there. Another dawn, and we set sail from Prince Rupert, down the famed inside passage of BC’s fjordland, to land in Port Hardy and drive through the night to back the next crossing to North Vancouver, and the road north to Whistler. It was a long day on the boat then driving, another boat and a short drive, but hey that inside passage is quite the sight, with channel between the steep sided mountains a few hundred metres at times, plus lots of seals, dolphins and whales to see along the way. After Breakfast in Squamish, a long time logging hub, now granola town, we hit the much improved Sea to Sky highway to Whistler. The 2010 Winter Olympics will be in part hosted in Whistler, so there had been a huge investment into the infrastructure of the Lower Mainland. 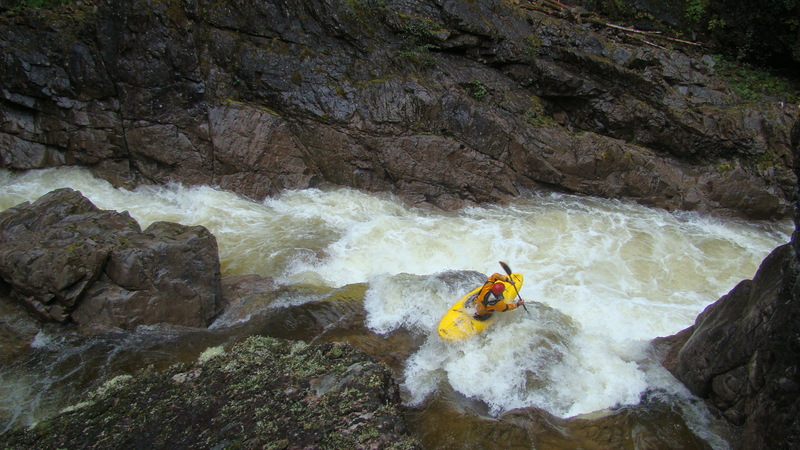 A quick run on the Clackamus to ensure we had not forgotten how to paddle, and then to our luxury suite in tourist town. We had a bunch of shopping to do for the 3 day trip, and some serious R&R. Whistler in the Summer had become very much a mountain bike resort, and next time I am there, the A Line trail is surely one I wish to hit. Come the morning, we were loading up and heading to the airfield, well air lake, as its all float planes out of Whistler. The 6 of us, loaded out boats, plus a few luxuries for the first night’s camp at the putin lake’s shore, and over the mountains we flew. The plane climbed up the Soo Valley and over the huge Pemberton Icefield. A massive expanse of glacial ice, with numerous mountain top glaciers feeding the icefield, which seamed to cover all we could see beneath the plane. We climbed over a ridge, and the Elaho river catchment stretched out below, fenced in by a long chain of mountains, all capped with glaciers, it was an impressive vista. Looking West, and straight ahead from the plane’s cockpit was the Clendenning, a near prefect U shaped valley, with wet granite walls glistening from the glacial runoff flanking both sides of the valley floor. Large side streams cascaded in from hanging glaciers, with wonderful waterfalls forming beautiful flumes, this was all but a movie scene from a wildlife documentary. With the occasional glance down at the river, I could see she was running heavy in glacial stilt, but the rapids appeared to be clearly defined, and well formed. No sooner than the valley floor lessened in gradient, the pilot banked the plane to the port side and we drop into the Clendenning Lake. Again the lake was walled in from huge rises of granite, and a picture prefect glacier at its head. We launched our kayaks, watched the plane take off and disappear into the main Clendenning Valley, it was silent, clear and everything you could see was amazing. A short paddle to the mouth of the lake, and we set up camp. As we knew it would be no work on the first day, we had brought in beer, steak and fresh fish to grill. A little luxury, and quite the departure from our Atnako adventure. As the sun started to set, I read the latest edition of the Economist and sucked on my sun downer we nothing but contentment in mind, oh and the steaks were heavenly too. Dawn broke, and we packed up and headed off. Our small side stream from the lake into the Clendenning was alpine in style and quick. The occasional tree was easy to paddle around, and the water level appeared to be medium, no rocks to hit, but no real push either. At the first major horizon line, a quick look took quite a while, with the bank side vegetation being so thick and knotted, meaning fly by night drop running or lengthy inspection. If you opted to portage, it was a slow and gruelling task, and at the next horizon line it was a 500m portage, that took some 2 hours to complete. This was a bit too much like the Atnarko for my liking, bush whacking in your drysuit is a tempestuous affair, with fallen trees from landslides blocking any and all easy passage. The rapid we portaged was a steep log filled boulder garden, that was formed from the landslides pushing debris into the river bed, no line in any part of the rapid was clean, and any comparing the water level to other trips, we had high water. This made what should of been a cruiser Class III/IV multi day run, instead we got a high water remote alpine run away with blind pour overs and the occasional dead wood blocking lines. We pushed off, with lots of criss crossing the water course to see around the next corner, often needing to drop in over the horizon line to see the route and eventual exit. Trying to keep the tempo up and film at the same time was a little fast go, all stop, fast go, all stop. As the river rose with the warm September weather, it was playing on our minds whether we’d make the normal overnight spot spot to camp. The perfectly flat gravel bar with lots of sand made for a great camping spot, in the fading light several hanging glaciers were well within view. This valley is well off the tourist trail, so there are no paths into this area, and so the remoteness as the sun dropped, and the bountiful deadwood supply made a great camp fire, we settled in to an evening of good exped food and a sounded sleep. Our camp did not get the early morning sun, so all the gear we could not dry from our fire we packed up wet, and with slightly lighter loaded boats, we set off. Progress was swift, a few stepper rapids made for a quick scout and off we went, the nature of the second day was more continuous gradient, moving onwards nearly always exposed the line and rapids exit. Adding to the rhythm was our eagerness to get the steepest section of the run done by lunch, to ensure we’d be out by night fall. Again for myself it was fast go, stop film, fast go, stop film some impatience to get on sparked a moment of sharp words, yet progress was swift, yet strenuous at times. Continuous boulder boofin’, plus quick zigzagging the river to find the way, and onwards. More portages, and we rounded another bend, to see thriver turn South, marking the promised land of less gradient about 3 Km away. Another portage, and when getting in, I slipped, and the boat launched sans paddler. I jump straight in the river after the boat, with my camera, passport and shuttle wagon keys inside, there was no option, especially as I could possibly stop it before the next horizon line. I grabbed the boat within 5m, on the lip of a slide, but the cockpit was exposed, and the boat filled up quickly, Satu ran down to help, and could not hold the boat and myself, so all three o fuss dropping intuit he rapid, I pushed Satu to the side into a micro eddy and swam after the boat. The guys were on the left side of the drop in a small eddy below, and Patch was on the left bank, the boat hit a central rock with a pillow, paused for a moment, in time for myself to catch up and grab the end grab in time to pull the boat to the left, and to wards the awaiting rescue crew. Had the boat went right, it would of been quite the hike for myself, as the rapids ran away for some 2Km just below! A close call of the all important end of the river exit plan. The last significant cascade tumbled down from a high glacier on our right, as we went through another long S bend, more boulders and then sharply, the valley floor opened out. We were through of the steep white water, and into a wider valley with numerous islands and different channels to choose from. Although the gradient had dropped off, the water’s speed remained quick, as we were amongst the now heavily treed landscape. One quick surprise in channels, was the river had a freshly cut a new course, now in among the trees, the water picked up and a large log jam guarded the exit. With the team grabbing trees to stop and get out, we soon dropped in to a small gorge, and spotted a young black bear, just before the confluence with the much bigger Elaho. At some point within the next 10km was our truck hidden on a logging trail, supposedly easy to see from the river. As you can already tell we missed the truck and paddled on downstream some 20Km more. Jeff who parked the truck, thankfully volunteered to jog back up the trail as the sun was dropping to get the truck some 23Km upstream. After an hour or so, Jeff and the ruck appeared much to our delight, and back to Squamish for a late night take out a little broken and very tired. The following weekend, Satu and I said a good-byes to the team and hung our with Kala, a friend from Ireland in Kits, a neighbour of Vancouver. We hit hr northshore biking trails, BBQ’ed on Jerico Beach and cruised the highlights of this great West Coast city. Over the next week of so we travelled through southern BC via the Okanagan Valley’s wine region, hot spring dwelling near Nelson and then on to visit my relatives in Medicine Hat, finishing with hanging out in Canmore with Patch for a long weekend, before the trip back to Europe and Autumn in Slovenia.